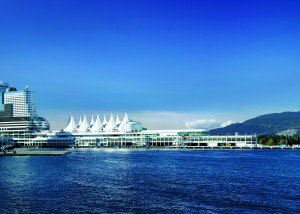 The five white sails atop Canada Place have been a Canadian icon, a recognizable landmark around the world since 1986, that identifies the Vancouver waterfront and Canada. The 90 foot sails are made of Teflon coated fibreglass. Canada Place undertook a roof rehabilitation project in 2010/2011 that included the replacement of the iconic sail fabric. The fabric of the internationally recognized five white sails was replaced with new tension fabric that mimics the specifications of the original five-sail design. The project helped to ensure Canada Place remain a hub of social and economic activity and continue to generate an economic impact to the local economy. The roof rehabilitation was made possible through the federal government’s Infrastructure Stimulus Fund – a key component of Canada’s Economic Action Plan. Canada Place worked with Architecture for Humanity to put some of the replaced sail fabric to use in their humanitarian projects. One of the projects was The Dream Big School in Tanzania. The Dream Big School is located in Fumagila Village, 16km from Mwanza City, Tanzania, Africa. Following the Canada Place sail restoration in 2010, material was salvaged and donated to the organizers to be re-used as a building material. This decreased both the financial and environmental cost of the project. Supported by the Tanzanian government the school serves as a model for future development across Tanzania with a holistic balance of sustainable living, a new integrated teaching curriculum and comprehensive teacher development and training. The sail fabric was used (much as it is at Canada Place) as a protective awning to shield people from the elements as they gather to learn, perform and celebrate their culture. Long a natural meeting place, Canada Place is honored to be a part of this central element at the school. Watch the time lapse video of Canada Place’s roof replacement project.